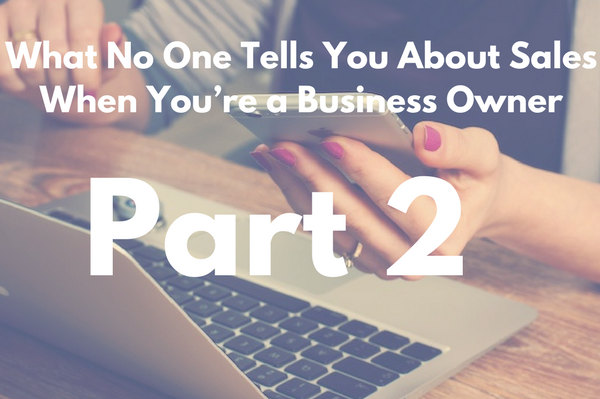 A few weeks ago I posted, “What No One Tells You About Selling When You’re A Business Owner, Part 1”. It was my way of taking everything I’ve learned about selling since I started my first consulting business in 2011, and giving owners a fast track to those valuable lessons. There’s so much I want to share, and I do much of that on my site. But for this Part 2, I’ve invited a few friends — fellow business owners who’ve been through it — to share their lessons learned as well. When I first started my business, I would go back and forth about how to price my services. Mostly because I wasn’t totally sure, and mostly because I was so eager to get the business. Oftentimes I would basically negotiate against myself… even before I proposed the price to the client. “A lot of us do this when we first start our businesses, especially if you’re a first-time entrepreneurs or launching something new, we have no idea how to price it, so we guess. Connect with Ariane at doyourthing.biz. When I first got started, conversations with prospects made me really uncomfortable. What if I come off too salesy? How do I steer the conversation towards asking for the business? As I got more comfortable talking to prospects, I realized that the best sales conversations aren’t designed to sell at all; they’re designed to provide immediate value. “Instead of thinking about having sales calls, think about hosting free consulting calls. I focus on giving some value on every sales call and ask a ton of questions about their business, goals, and biggest problems — usually that way the client is the one asking for ‘next steps’ or ‘how can we work together’. It’s much easier on me and more effective than ‘actively’ selling. Takeaway: Don’t think of them as sales calls. Ask great questions and provide value in every conversation, and clients will want to work with you. Connect with Tony at intentionalspark.com. When you start your business, it’s natural to want to go as broad as possible; offer the widest range of services, serve the widest array of customers. The fear is that if you narrow your focus you might cut yourself off from potential clients and revenue. When you try to do it all, you actually make it harder for clients to say yes. And the opposite is true: when you niche down, it makes selling easier. Rahul Varshneya and his team found this out three years ago when they narrowed the focus of their company, Arkenea. Takeaway: Don’t be afraid to narrow your niche. It will make selling to your ideal customers much easier. Connect with Rahul at arkenea.com. So much of the advice around growing sales revolves around getting new leads, subscribers, etc. — what I call “buying new land.” But most people are actually sitting on a gold mine without even realizing it. I’m talking about connections and referrals — the people who know you, know the great work you do, and can introduce you to others who would benefit from working with you. Laura Mignott of DigitalFlash agrees, and thinks connections can — and should — be one of the best ways to grow your business. “In terms of growing your client base, we get this weirdness where we don’t want to ask people for help. As if asking for help is somehow a sign of weakness. And especially if you’re in B2B, you assume that no one you know can help. But you never know! And if you don’t ask, you won’t ever get anything you want. Takeaway: Don’t be afraid of asking for connections, or asking for help. Do it early and often, and make it specific. You never know who may be able to help you. Check out Laura’s podcast, The Reset Podcast. As new business owners look to grow, nearly any client seems like a great client or a great project. But just as important as taking enough clients, is taking clients you enjoy working with. “No matter how lucrative the project might seem, it’s never worth the frustration and pain. For me, the best clients have been the ones where the ‘selling phase’ was easy. We hit it off, we understood each other, we were on the same page. The worst client experiences have been the ones where it was difficult from the start or where we forced a ‘fit’ where there was none. Connect with Maria at red-slice.com. This one is near and dear to my heart — it’s the foundation of everything I do with Growthworks Solutions. I’m living proof that it can be learned — I dug in and taught myself everything I could about sales, found a selling style that feels natural, and learned to sell. And of course, now I teach others how to do it too. Takeaway: You’ll have some misses, but don’t lose hope! If it helps, find a coach to teach you. No matter who you are, you can learn to sell. Like a boss. Want to learn how to sell confidently, consistently, and for continued growth? (Like a boss!!). Sign up to learn the secrets of confident selling at growthworkssolutions.com. A version of this post originally appeared on my website. President, Growthworks Solutions — Helping business owners and entrepreneurs sell like a boss.